Enjoy these posts - I know I did. Have a great weekend! Yay! 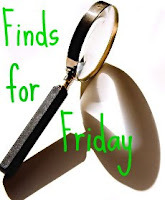 Thanks for posting Friday finds! I love them. :) Have a great weekend, Joanne! Thanks for sharing these links and for your testimony. Hope you have a wonderful weekend. Thanks, Jo. I'm honored to make your list! Appreciate you!